To imagine the immense benefits that the KESM has had in the pathology space, consider this: a pathologist can examine up to 350 sections of human tissue per day, across more than a hundred different cases. The KESM can slice approximately 3,600 sections per hour or more than 28,000 per day across many masses of tissue. The results achieved are also far more detailed, capable of detecting cancerous cells and even malignant cells that may still exist in tissue after chemotherapy treatment. Computing biological differences within an organ, or between organisms, is especially useful for animal models used in pre-clinical drug discovery research in a pharmaceutical trial. This enables quantification of microvasculature and may provide insight into various diseases, such as Alzheimer’s, diabetes, and cancer. By examining large volumes of tissue at maximum light microscopy resolution with high throughput, scientists and pathologists can improve the accuracy of morphological assessment and identification of normal and diseased tissue states. By combining sectioning and imaging into a single step, a large part of the traditional pathology workflow is automated. This allows for a greater speed, precision, throughput, and scale at which tissues are digitized. To handle high-resolution data of over a terabyte per cm3, sophisticated data processing software is applied to model 3D tissue reconstructions, providing interactive image views, and applying quantitative analytics. This allows quantitative analysis to be performed on 3D image stacks of whole mouse organs, which is extremely difficult, expensive, and time-consuming with traditional manual techniques due to the size and lengthy experiments. Mouse organs are heavily relied on in academic research and early pharmaceutical research; they are beneficial in the pre-clinical phase of pharmaceuticals and are critical to advancing medical research. “We run a company on a service basis, so we build and operate,” comments Todd Huffman (CEO). 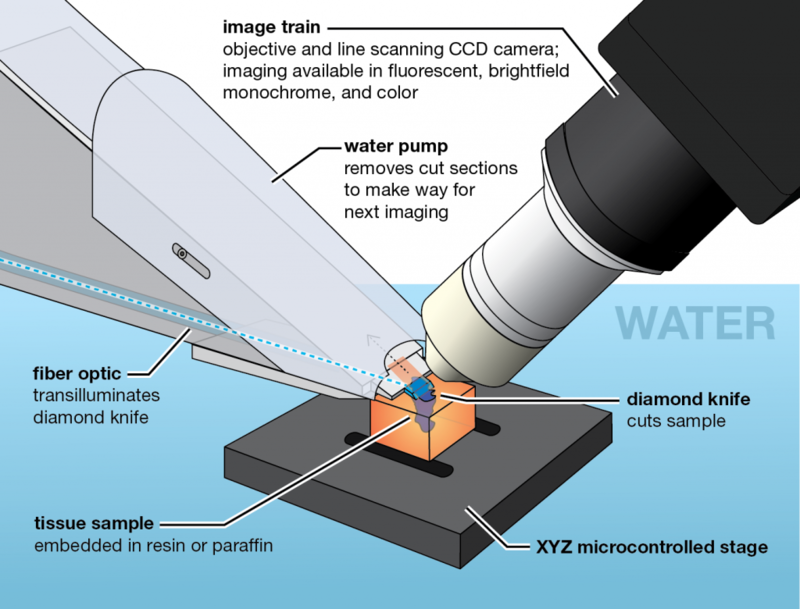 Instead of selling its Knife Edge Scanning Microscopes, 3Scan has chosen to run its business as an outsourced service. As a Contract Research Organization (CRO), they work with clients to slice and analyze their pathology samples. After running the sample through the KESM and processing the data with the software, a report is compiled sourcing from algorithms, and an onsite licensed clinical pathologist interprets the results. At this time, the company is primarily working on fundamental research with universities and pharmaceutical companies. The company is looking into getting FDA approval to apply their technology to clinical settings as well. Undoubtedly, like other industries, the future of medicine will rely heavily on technology to improve care. Going forward, patients and doctors alike can expect higher accuracy and improved efficiency. However, like the KESM, the success of automated devices and digital imaging is dependent on the brains behind it. There are a host of pressures on the industry and the individuals involved. Both patients and doctors want to be sure they receive the right information, and that often requires more tests and higher costs. The services that 3Scan may soon provide could reduce these hurdles substantially. “The KESM and what we’re able to do because of the KESM with Teledyne DALSA’s help is helping create a micron level applet of the human body, piece by piece. As personalized medicine becomes more important, precise diagnosis becomes more important, being able to have these spatially indexed points of information will help researchers and physician create better outcomes for patients,” said Huffman on looking to the future.